I met DJ Martin Bell (“not the man in the white suit! )” at the station where he works, Direction Radio in Epsom, Surrey, for a Guardian story published today. 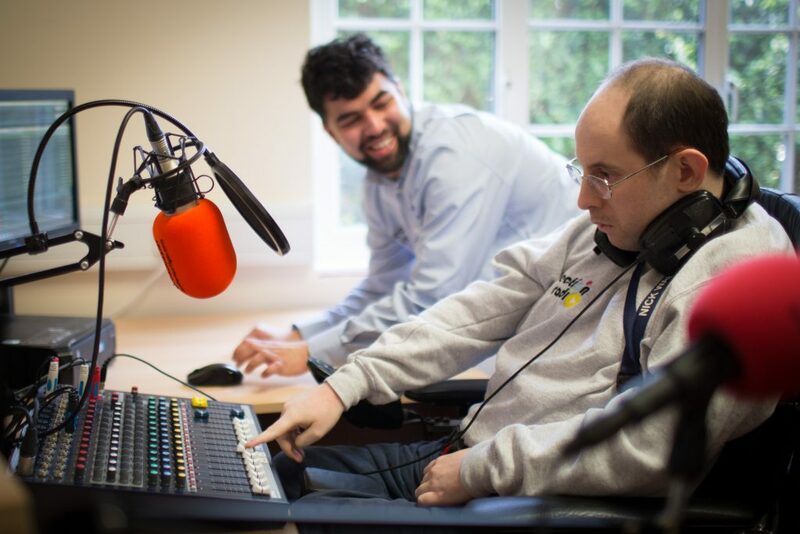 Online station Direction Radio is part of social care provider Surrey Choices’ day service programme. 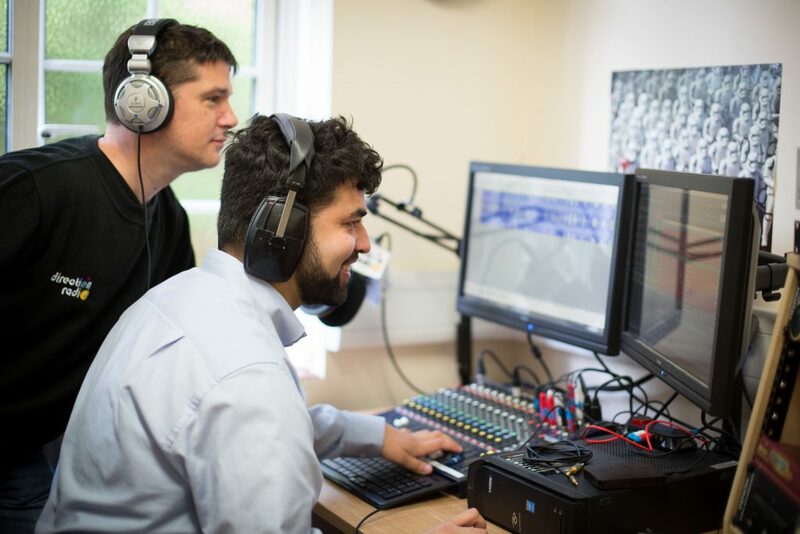 It helps people with physical or learning disabilities to develop skills in broadcast and production. 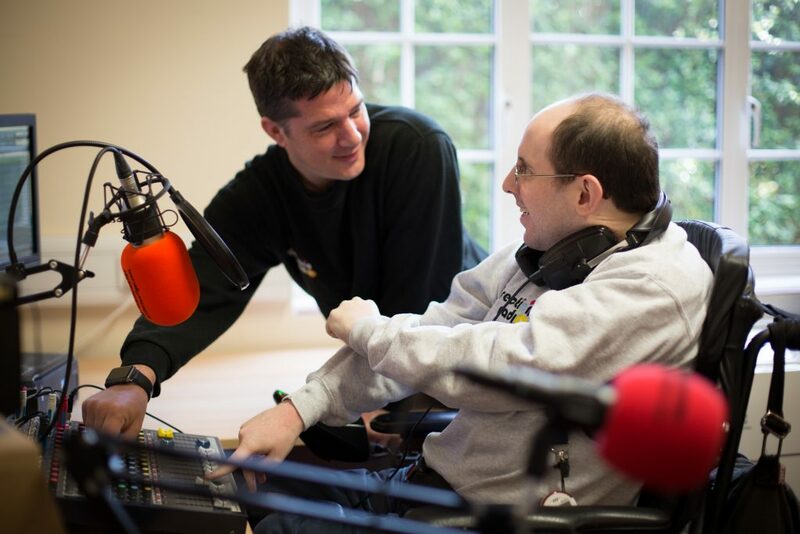 You can read my report on Martin and his fellow DJs on the Guardian website (all photos from Surrey Choices). Six weeks ago I launched a crowdfunding campaign for Made Possible, a groundbreaking collection of essays on success by high-achieving people with learning disabilities. The book is inspired by my sister, who has the learning disability fragile x syndrome, as well as by some of the remarkable, succesful people I’ve met and interviewed over the last few years – all of whom happen to have a learning disability. I’m delighted to say the book is now 100% funded, such has been the fast pace and mounting enthusiasm for the project. More than 200 diverse people and organisations have got behind the book since its launch on 6 September. Made Possible presents the authentic experiences of a range of professionals who have a learning disability in different areas like theatre, music, art and campaigning. And, for the first time, these high achievers tell their own personal stories of success, in their own words. It is a book to change the current narratives about learning disabled people, narratives that mean they are talked about as somehow less than human. Thank you to everyone who’s got involved and backed this book. I can’t wait to start working on it. To find out more, follow the book’s progress and to pre-order a copy, see Made Possible on the Unbound website. It’s taken less than four weeks for the book I’m editing, Made Possible, to become more than 50% crowdfunded – and this is all down to the project’s incredible and growing band of supporters. 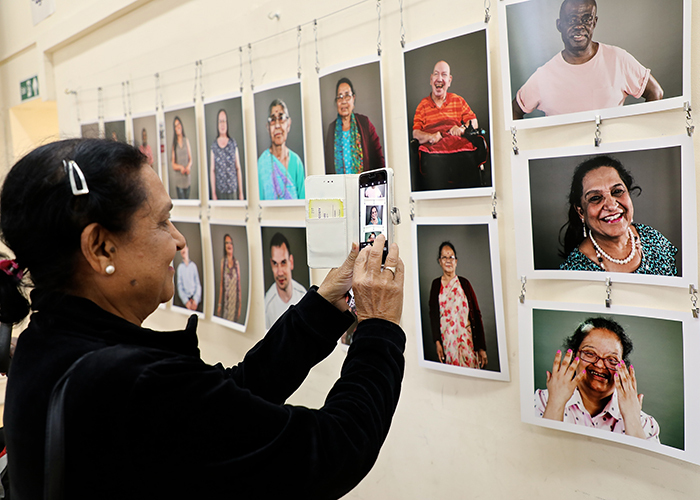 The anthology includes the experiences of people with learning disabilities in their own words – it challenges the current narratives on learning disability which dictate that people are pitied, patronised, and not heard from directly. 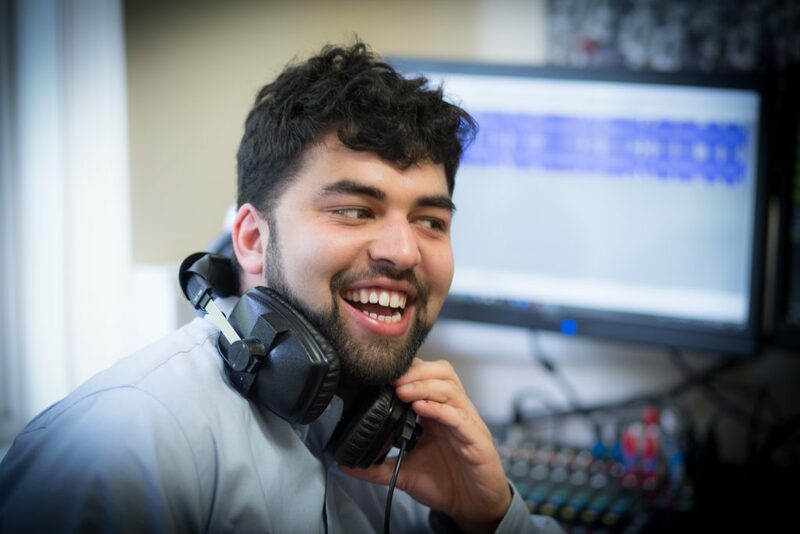 It presents the authentic experiences of a range of professionals who have a learning disability; these high achievers tell their own personal stories of success. 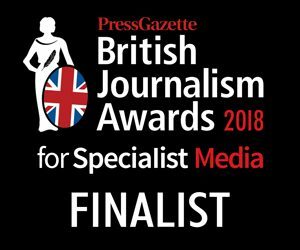 As a social affairs journalist, most of my work over the last 20 years has been influenced by the fact that I have a learning disabled sister. I know that her learning disability doesn’t define her, but society inflexibly labels her in terms of her condition, instead of recognising her personality, skills and abilities. Attitudes must change – and that’s why we need this book, which is already halfway to being published (click here to make a pledge to help publish the book and join its community of supporters). To hit such a milestone so soon reflects a determination of so many people to shift negative attitudes towards learning disabled people. Made Possible also considers the wider context that undermines people’s talents and aspirations. For example, we’re in party conference season and the Conservatives are gathering in Manchester as I write. Yet most politicians (with a few rare exceptions) overlook learning disabled people – despite the fact that more than a million people with learning disabilites are entitled to vote. This is not only an equality issue – why does the political world seem to bypass people who have both a right and a desire to go to the polls? – but vote-needy politicians could do with wooing this signifcant chunk of the electorate. Many of this book’s supporters (scroll down on this page to “Supporters”) including campaigners, activists, self-advocates and support providers – are among a strong and growing lobby working hard (all year round – not just during conference season) to change this. I’m looking forward to reflecting the vital growth in this kind of activism and awareness-raising in Made Possible. What does someone who is supported by social care look like? 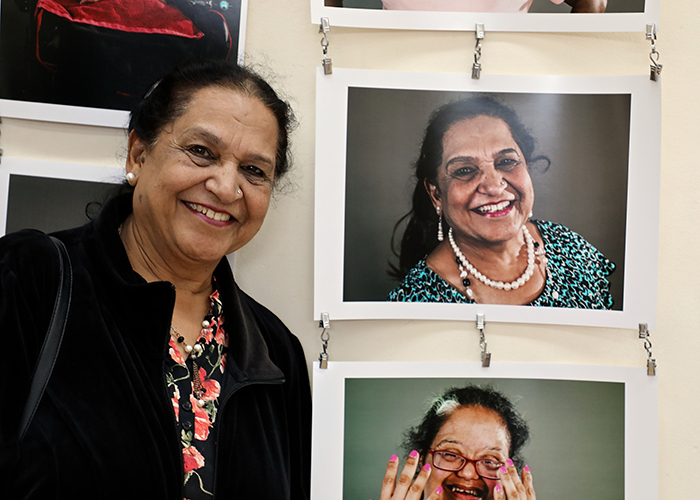 Transforming stereotypical perceptions of social care is the aim of a new photography exhibition showing in London this month – some of the featured images are shown below. SELF Season 2 is a collaboration between photographer Dean Belcher and social care provider Certitude. 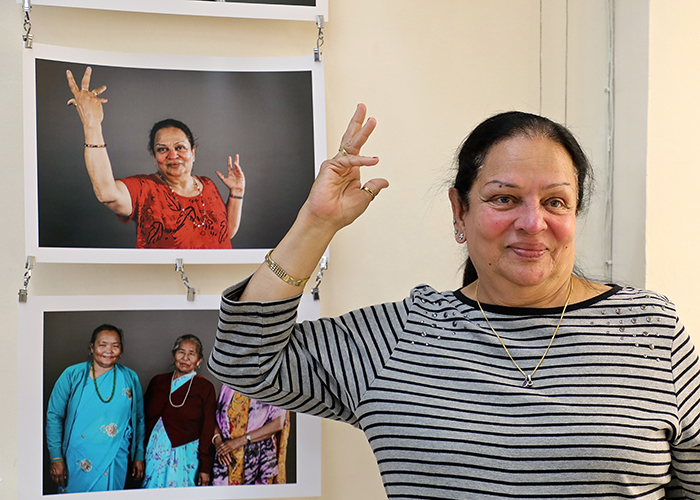 Everyone featured in the exhibition is either connected with Certitude or with activities offered by Age UK Hounslow, west London. 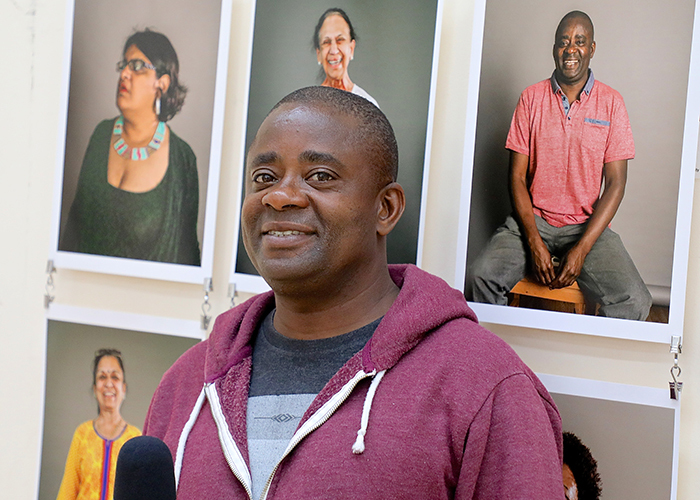 The project’s ambition is to use imagery “to depict the commonalities between people within social care rather than reinforcing the often-imposed barriers and roles that people are given”. 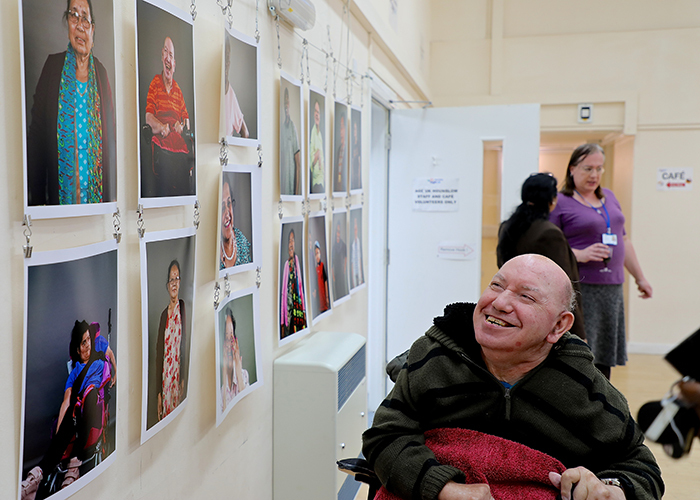 The new show follows the success of an exhibition (SELF: Portraits in Social Care) held in Brixton earlier this year. When I tell people that my youngest sister has the learning disability fragile x syndrome, there are usually two common responses. People either ask what fragile x is, or they want to know kind of support she needs. Not many people ask my sister’s name (Raana) or how old she is (28). They do not ask about her skills (baking, ceramics), what she likes doing in her free time (zumba, movie nights), or her achievements (so many to choose from – her artwork, her college course, her public speaking, how she looks after her nephews and niece). 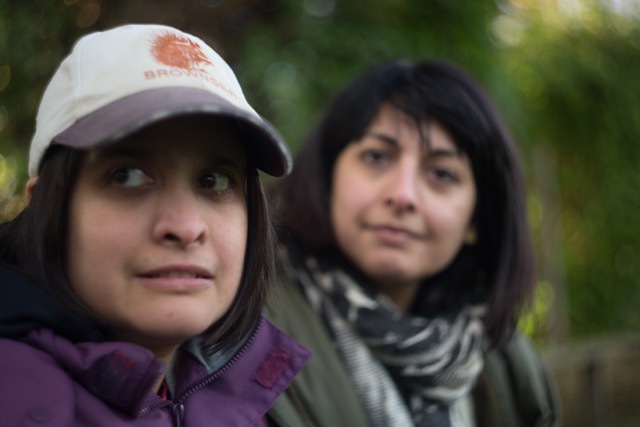 In a piece today for Learning Disability Today, I explain how the focus on my sister’s disability, rather than her ability, is a symptom of wider negative public perceptions about learning disability. Such perceptions mean that people with learning disabilities are regarded as devoid of personality, passive recipients of care or deserving of pity. Overturning these attitudes and challenging stereotypes about people like my sister is the aim of the new book I have just launched, Made Possible. Made Possible is a crowdfunded collection of essays by high-achieving people with learning disabilities. The book, with the award-winning publisher Unbound, features the experiences of talented professionals in different areas like film, theatre, music, art and campaigning. To read more, see the blog in Learning Disability Today. First off, a HUGE thank you to all you brilliant early bird pledgers for getting Made Possible off the ground – I’ve been blown away by your support, feedback, encouragement and enthusiasm. Your help in creating this book means that Made Possible reached a major crowdfunding milestone after just 2 days – the 25% mark. Sensational – we’ve not even been going for a week and we’re a quarter funded! Thanks too to those of you who’ve fearlessly embraced the unfamiliar waters of crowdfunding; this is all new to me too, so we’re in it together. Some of you have asked why this method to create Made Possible. Good question. Unbound felt right, not least because it’s an award-winning publishing company, but because it connects readers directly with the books they want to see written. In a nutshell, you support the book you want to read – without your pledge, the book can’t get published. And Unbound breaks the traditional boundary between reader and writer – an approach that overturns the status quo seemed like absolutely the right fit for a book that aims to do the same thing. So here we all are, this is now our Made Possible community! Thank you for being a part of it – it’s going to grow, and as it does, we get closer to the aim of challenging some very outdated mindsets about learning disability. If you’ve pledged, please do share the news about what you’re helping to create, and encourage others to help make this happen. You can use #MadePossible on social media and see who else is talking about what we’re trying to do. 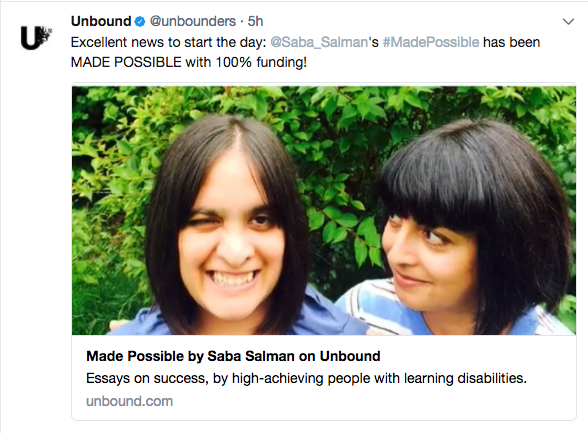 So pleased to launch this today with crowdfunding publishers Unbound – a book challenging perceptions of learning disability . Have you ever heard a person with a learning disability talk about their talent, or share the secret of their success? No. That’s why Made Possible needs to be published. It’s a collection of essays on success by people with a learning disability. There are 1.5m people with learning disabilities in the UK today – my sister among them. But our society – media, politicians and the public – barely gives them lip service. If ever learning disabled people do get a mention, they are usually talked about as scroungers who are a burden on the state, or superhumans who have triumphed over adversity. People with learning disabilities are pitied or patronised, but rarely heard from in their own words. This new book challenges the current narratives. This book needs your support to get published – find out how to help here, and please share widely. 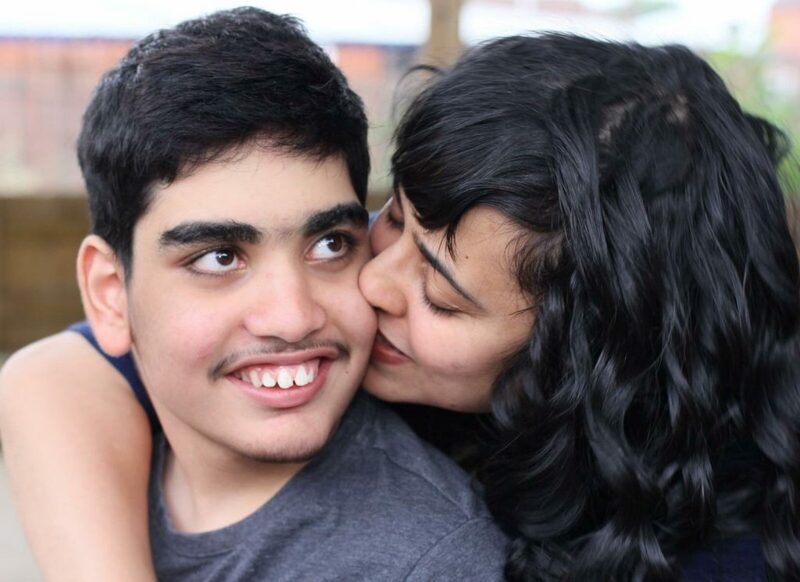 When Parmi Dheensa’s son Callum kissed a classmate on the cheek not long after starting at a special needs primary school, a teacher asked his mother if this was “culturally appropriate”. Dheensa said that as long as the classmate was happy, nothing in her son’s Punjabi heritage forbade such displays of affection. It is just one example over many years of professionals leaping to incorrect conclusions based on the ethnicity of her severely learning disabled son, who is now 19, says Dheensa. They also assume she does not work and is supported by an extended family when in fact she is a lone parent who works full-time. Dheensa, 43, was once told that her son’s support – he lives at home and is at a special school – was “better than it would be in India”. Fair point maybe, she says, but irrelevant to a British-born, Midlands-based family. My Guardian article focuses on Parmi’s charity, Include Me Too, which works with 1,500 families a year. It has launched a campaign for the government to review its equality duties in relation to special needs education and support for BAME communities. 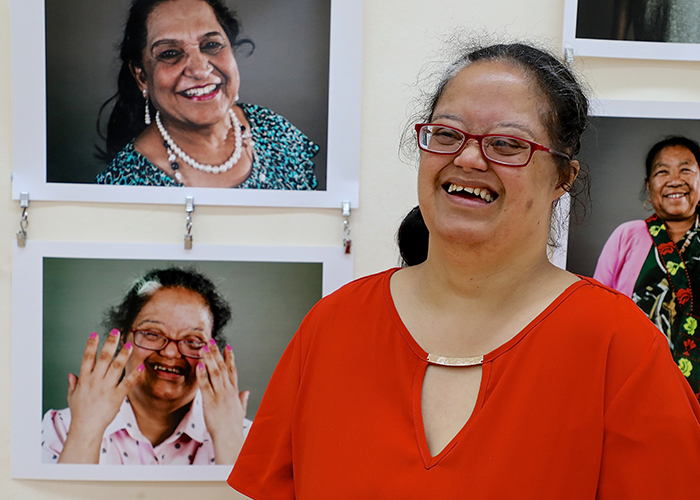 The charity has now launched a campaign asking the government to review BAME representation in government decision-making (existing involvement is, says Dheensa, “tokenistic”) and a new disability and equality strategy to ensure families get better support. 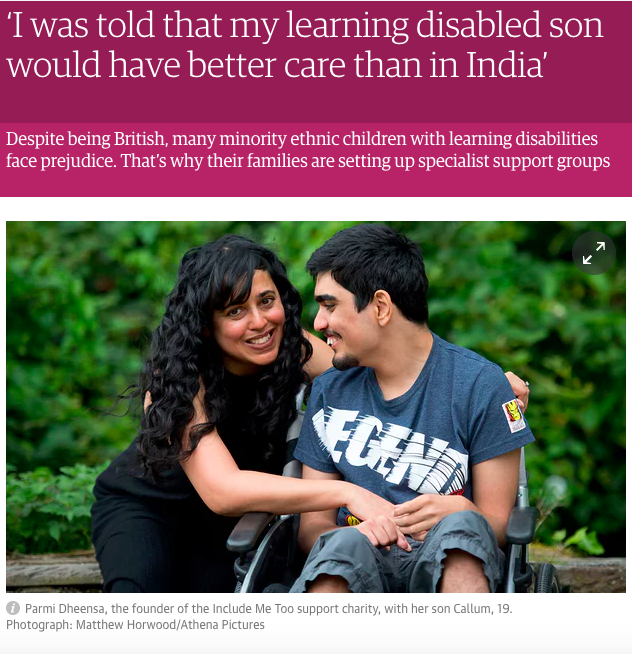 The criticism is that professionals do not fully involve parents in reviews of the support they require, or in drawing up education, health and care plans, and parents or carer forums are predominately white British. Read the article on the Guardian website. New research, which we launch today, paints a picture of far too many young families struggling. Parents with children under the age of 18 are increasingly anxious, according to Spurgeons’ Parent Report, and many feel that there is little support available. The research shows half of parents worry their children have low self-esteem or are unhappy (46%) or are being bullied (46%)*; whilst 42% of parents think there is little to no support available from statutory, community or voluntary services to help with family challenges. And it is many of the most vulnerable who are struggling the most. The ones who cannot or do not have a strong, stable and supportive network of family and friends to turn to. These are the families we work with, day in, day out – their children are among the 4 million living in poverty in the UK today. They are the families for whom support seems very distant and hard to attain just when their needs seem to be increasing. What’s important is that families get the support they need when they need it. And that’s where charities like ours come in. Spurgeons Children’s Charity is driven by its mission to improve the lives of families and children who are struggling to cope; and to see every child given the chance of a hope filled future. It is 150 years since we were first founded, but we still work at the heart of communities to improve the life chances of some of the most vulnerable children and families in England. Our focus is supporting families who struggle to support themselves through intervention and help that centres on the child. The reality is, despite the immense wealth and opportunities for social mobility, life for some families is as tough today as it was when we were first established. Inequality today may look different; we may know more about causes and solutions; we may spend more time talking and writing about it; but it is still an enduring social and economic scar on our society. We offer a range of different services across the country. 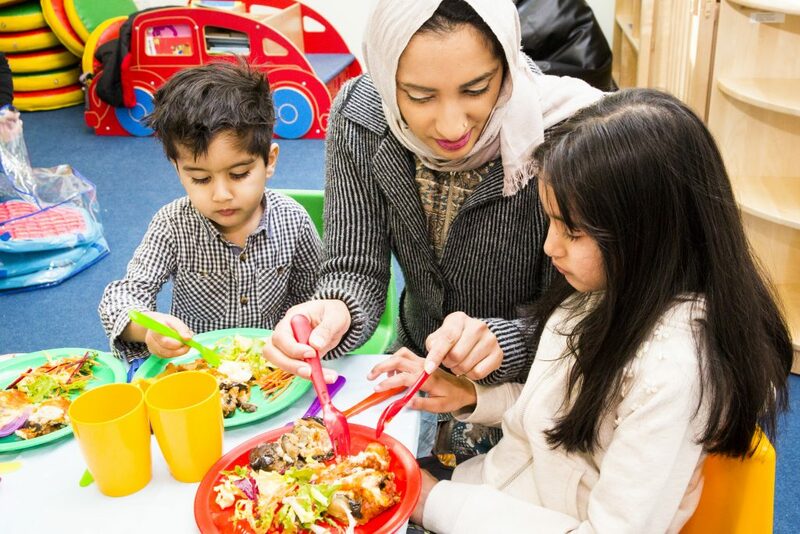 For example, our 23 children’s centres support parents with young children to access the help they need, ensuring poverty and deprivation don’t become barriers to a better future. We work with local partners in communities with high levels of deprivation across the UK, supporting parents and their children from pre-natal stage up to the age of five. When parents need to develop new strategies for dealing with issues; or they feel they maybe aren’t coping as well as they could, our support worker teams are there. Sometimes just to listen; but often to provide practical support and advice too. There are a range of parenting courses; opportunities to stay and play and a chance to meet and talk with other parents. The chance to access peer to peer support can be invaluable and a life line for many parents who often feel alone. This is true for both mums and dads and we’re keen to recognise the important roles fathers play in their children’s lives. 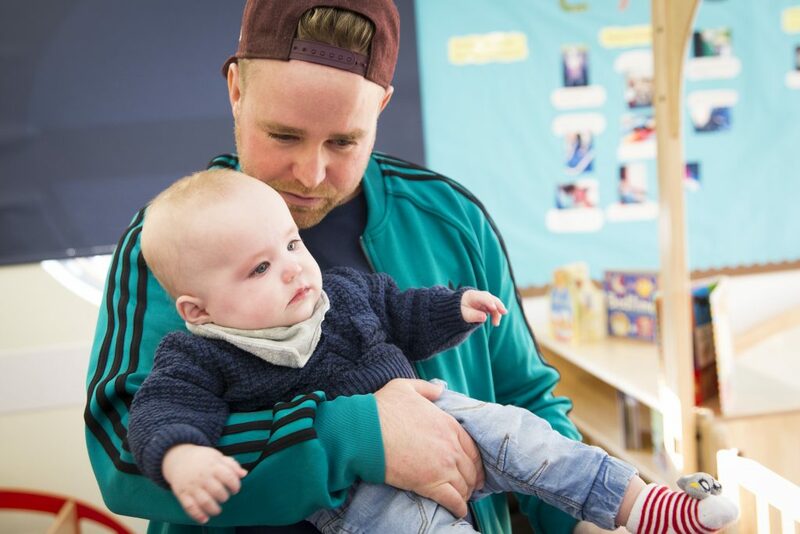 Our Saturdads project, which started in 2009 and worked with 89 dads last year alone, helps fathers develop stronger, positive relationships; build peer support networks; and generally build their confidence as a parent. Too often public funded services are portrayed as places of dependency when the reality is a timely intervention can be the route to flourishing, maturity and development for parents and children. The Parent Report we publish today gives us an opportunity to compare the views of the wider parent population to our own insight. From parent feedback at our services, through to safeguarding reporting, we are able to draw out comparisons and identity some common themes. What we do know from the work taking place is that it’s not always easy for families to reach out. We need our services, and those offered by others like us – from government, charities, schools and GPs – to be recognised as the safe and reassuring places we believe them to be. Where parents can take their children and be free from judgement at a time in their life when they need it most. It’s only fair that we all accept some responsibility with this – if parents don’t feel that they can access the support available, what can we do differently to help them on their way? More awareness maybe; more accessibility for the isolated and hard to reach groups most definitely; but maybe it’s more than that. In a world where they are so many expectations and pressures, living up to a perfect ideal can make a tough job even harder. From our part, we want to ensure there is always someone there to support families – especially those in greatest need – with good information, advice and meaningful support. All figures, unless otherwise stated, are from YouGov Plc. Total sample size was 1,842 GB parents with children under 18 years of age. Fieldwork was undertaken between 21st – 27 April 2017. The survey was carried out online. The figures have been weighted and are representative of all GB adults (aged 18+). * When asked about the three issues they are most concerned about for their children, either now or in the future. The Conservatives’ manifesto pledges on social care have been both controversial and muddled, but at least the issue of support (and how we pay for it) is finally a subject for mainstream national debate. Campaigners have long argued that plans to fix the broken social care system must be high on the political agenda, but many of the people who rely on it most are rarely wooed by politicians – as the above quote from Gary Bourlet makes clear. The links below offer accessible resources and general voting guides to support people to vote and find out more about election issues (I’ll update this roundup as – hopefully – more is added). Labour – accessible formats here. Conservatives – easy read and accessible formats manifestos here. The Green Party – “All manifestos and alternative formats” here, including easy read, braille and audio. There is no mention of how to get an accessible version of the UKIP manifesto. Easy read guide to voting in the general election published by the Electoral Commission and Mencap – pdf: “People with a learning disability have as much right to vote as anyone else. Don’t let anyone else tell you different.” (See also this pdf from the Electoral Commission on disabled people’s voting rights). Every Vote Counts from United Response is “aimed specifically at making the process easier to understand for people with learning disabilities and those that support them”. Video guide to voting from Brandon Trust is a video guide that “explains how things work in the UK, what you need to do to register to vote, and the different ways you can vote”. Event at 10.30am Sat 3 June University of East Anglia: “Learning Disability nursing students at the School of Health Sciences have organised an information day for people with learning disabilities so that they can find out more about voting in the upcoming general election…The political parties will be represented at this drop-in session and will provide accessible information and discuss their policies with people with learning disabilities.” Also see the related Facebook group. You can also follow the hashtags #LoveYourVote #EveryVoteCounts #LDvote #EasyReadElection #LDVote2017 on Twitter. * This post was updated on Mon 22 May with information on the University of East Anglia event, Green Party manifesto and Conservative Party manifesto, on Fri 26 May with RNIB info and Scope’s voting guide and on Fri 2 June with the United Response resource. Related video: Kathy Mohan angrily asks what Theresa May intends to do to help people with mental health problems and learning disabilities.